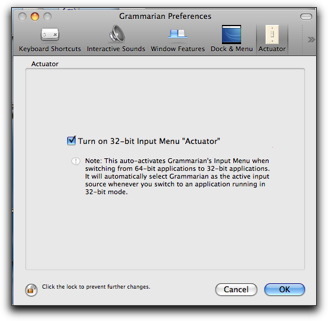 New for Snow Leopard/Leopard functionality/compatibility: Grammarian "Actuator" code automatically activates the Grammarian input menu component as the active input source whenever you switch to an application running in 32-bit mode. Note: The Grammarian input menu will not be active in the Finder. Apple forced the Snow Leopard Finder into 64-bit only, and the Finder still cannot be switched and launched to 32-bit mode. 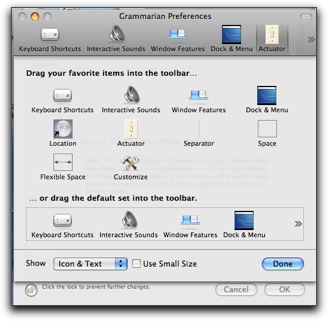 New for Snow Leopard/Leopard functionality/compatibility: Grammarian "Actuator" preference pane. The preference pane allows the activation/deactivation of the Grammarian "Actuator" code. Customize the Grammarian preferences window toolbar by selecting "Customize". Drag the "Activator" icon into the toolbar. The Grammarian "Actuator" provides more reliable Input Menu component switching for Mac OS X 10.5.x and Snow Leopard, Mac OS X 10.6.x. The actuator code will automatically become active as the default after installation once the computer is rebooted. Grammarian also installs a login item on Snow Leopard for automatic startup. Fixed: Workaround for Safari/Firefox shared-memory failure crashes. Input method components are not available to applications running in 64-bit mode with Snow Leopard. You still must follow this Snow Leopard 32 bit/64 bit mode FAQ to enable the 32-bit mode with your applications.